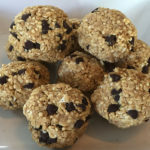 No Bake Quinoa Bites - A Healthy and Delicious Snack or Dessert! If you are trying to limit the amount of sweets that you are eating, then these No Bake Quinoa Bites are a must-have for you! No bake quinoa bites. A delicious and healthy snack. I was first introduced to quinoa years ago when it was the newest ‘superfood’ on the market. Quinoa, pronounced ‘Keen-wah’ is a grain that is high in both fiber and protein. It also has a significant amount of iron and potassium. You can also make it on the stovetop. It is important to remember to make sure your quinoa is rinsed. Some companies package their quinoa already rinsed and it will tell you that on the package. Another hint when cooking quinoa – always toast the grains for a few minutes in a hot skillet. This will help bring out the flavor and provide a better texture for the end product. 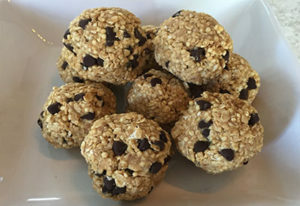 With just a few basic ingredients, and no refined sugars, you will have days worth of no bake quinoa bites ready for when you are craving sweets the most. You can eat this for a quick breakfast or you can have them for a healthy snack between meals. The most popular way to eat them in our house is to eat them after dinner to curb that sweet tooth. However you choose to eat them, plan on making them every Sunday so that you have plenty on hand to get you through a long week of trying to eat healthy! A delicious and healthy breakfast, snack, or dessert option for those who want to eat healthier! In a medium sized mixing bowl, combine all ingredients and stir until well incorporated. Using slightly damp hands, roll the mixture into bite size balls. You should end up with 12-18 depending on the size. Place the balls onto the lined baking sheet and place in the freezer. Let them get frozen for at least 2 hours before eating. Store in an air-tight container in the freezer.